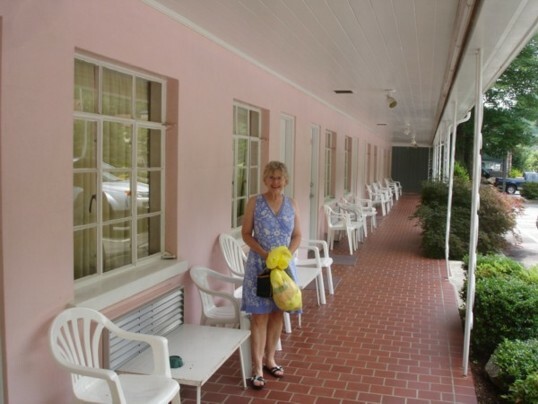 I became a fan of Fuzzy Lizzie the Vintage Traveler when she was sweet enough to allow me to share her write-up of The Pink Motel with my Retro Roadmap Readers. So it is with great delight that I share another one of her vintage place finds, M.A. Pace’s Store in Saluda, NC. She calls it a Time Warp store, and I know exactly what she means. Thanks for the find Lizzie, and for allowing me to put your info on the Retro Roadmap! If you have been reading The Vintage Traveler for a while, you already know that I love what I call time-warp stores. These are like little pieces of the past that have somehow survived. Unfortunately, they are getting harder and harder to find. Lots of times, the owners are getting up in years, and when they retire, that’s the end of the store. Many times they become gentrified, like the wonderful old Mast Store in Valle Crucis, NC. Others just sit empty, and are soon forgotten. I figured I’d better pay a visit to one of my favorites, the M.A. Pace Store in Saluda, NC. This store was founded in 1899 by the current owner’s father. It’s been in the same building for 100 years. But in the meantime, if you happen to be anywhere near Saluda, go see Mr. Pace’s store before it is gone. And if you are not near it, get out there and find your own time-warp store! Then let me know about it so I can hopefully wrangle a visit. The store is now a combination of new and old merchandise, with all the old stuff being original to the store and not for sale. The original shelves line the walls, and they are full of old shoe boxes (yes, with the shoes inside), sewing notions, and clothing boxes. There was a sign that read not to open the boxes, but Mr. Pace said he’s turn his head so I could peek into a few! There is everything from 1910s boots to shoes from the 60s. And no matter how sweetly you ask, he will not sell – unless you want to buy all of it! See some of Lizzie’s photos of what she did see in the store here in her Vintage Traveler post, and read more about the neat old town of Saluda, North Carolina on her WNC (Western North Carolina) Traveler blog. Thanks for bringing this neat old place to our attention Fuzzy Lizzie! Now Retro Roadmap readers can check it out if they’re in the area. With kind permission from Fuzzy Lizzie, I am reprinting part of her fabulous Vintage Traveler blog, highlighting a vintage motel that I’d only ever seen the sign from. When you see that sign, you hope the place is as cool that, and from Lizzie’s report, it looks like it is! I can remember the Pink Motel from my childhood. We were on our way to Gatlinburg, Tennessee when we passed by it, and my little sister, who was probably about 6 at the time, had a fit to stop there for the night! The motel is still open, still a mom and pop, and seems to be doing well. We went in (we spotted Pink Motel tees in the window) and the woman in charge told us all about the place. And she also said they are getting ready to repaint the sign. 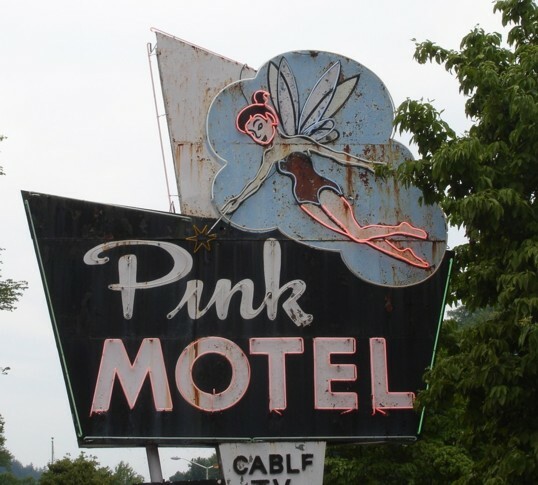 The sign is pretty spectacular at night – all pink except the wings and her swimsuit which are blue, and the star on the wand, which is yellow. Yes, it really is pink, and pretty darn fantastic. The rooms open up onto the river which runs along the back of the motel. Thanks so much for the report from the road Lizzie! I can’t wait to share more of your finds with the Retro Roadmap community!